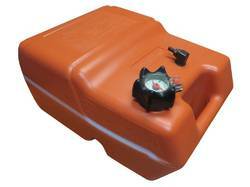 Made of high quality polyethylene, this 23L Benzina fuel tank will mean easy generator refilling on the campsite, farm, worksite or wherever else you may need it. These cans are made to meet Australian Standards (AS2906) for fuel containers. They are lightweight, rust-proof, and will not crush or dent. The fuel cap incorporates a fuel gauge for easy level detection.